My first CD-burner was purchased in mid-1998. It was a Dysan CRW-1622 2x burner which came with two blank discs. A Memorex CD-RW4224 was added as an extra burner about a year later, and it also came with two blank discs. Since then I’ve owned and used numerous CD/DVD-writers, and I’ve bought plenty of discs. As someone who created a substantial number of CD-R items over the years and spent inordinate amounts of time designing elaborate inserts for his personal audio collection, I gradually developed various tricks and methods that made the final recorded compact disc look as semi-professional a product as possible. For instance, if not using thick high-quality paper for the inserts, one cheap trick I learnt is to add inlay cards to act as stiffeners behind ordinary 80g paper. Now, if you’re not sure what inlay cards are, they are sometimes also known as inserts or index cards and are from the days when blank CD-Rs came with jewel cases, usually in a pack of ten, and usually in a box like the one below. And those almost always come with inlay cards. Inlay cards became as regular material components of my CD production line as would colourful cases, and this collected stash of inlays turned up again a few weeks ago while clearing out and backing up a bunch of old CD-ROMs. 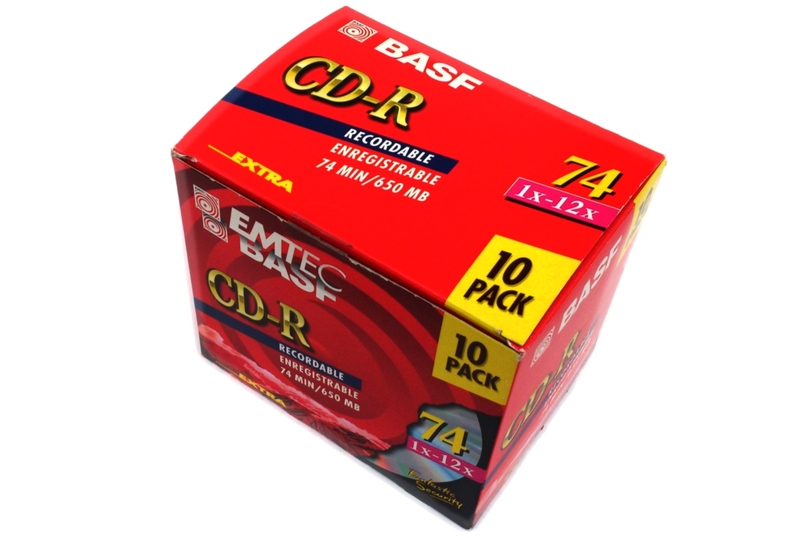 It was then that I took a much closer look at the various brands as well as the designs and the smallprint on those inserts and noticed how, over a period spanning over a decade, not only had BASF become Emtec, also the layout styles had changed, as did the quality, the warranties and the handling instructions — highlighting how recordable optical media had very rapidly evolved from an expensive investment for computer professionals to a consumable product for the unwashed masses. As capacities and recording speeds increased, so did the warranties. Early CD-Rs, for instance, only had a one year warranty whereas today they have a lifetime guarantee that still doesn’t cover your precious recorded data. My oldest discs warned about operating temperature ranges of -20 to +40 degrees Celsius; today they’re safe between -5 and 55 degrees. Admittedly, this is hardly vintage or collectable matter (yet). Unlike floppy disk sleeves or Betamax tapes, this stuff has no retro “coolness” factor whatsoever. But these paper inserts covered almost 15 years of my life. This entry was posted in Media and tagged art, CDR, design, Engrish, junk, personal. Bookmark the permalink. Hello~ I am interested in your CD-Rs, Is it possible to sold me them? No, as you’ve surely read in the article / gallery, I’ve thrown them out.